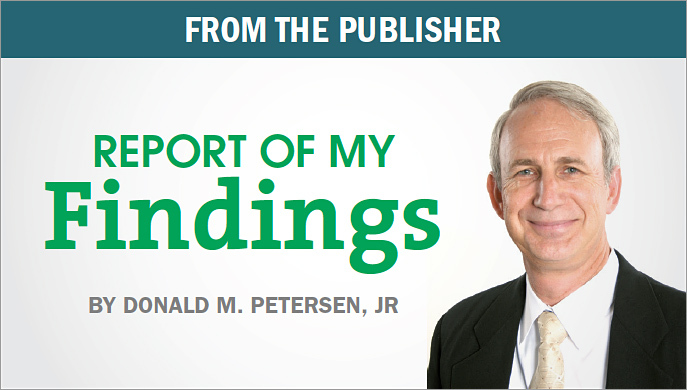 Donald M. Petersen, Jr. is the editor/publisher of Dynamic Chiropractic, the profession's most widely circulated publication with a readership exceeding 70,000. While not a chiropractor himself, his father and grandfather were both DCs. Mr. Petersen's goal is to operate Dynamic Chiropractic and its website, chiroweb.com, as effective tools stimulating growth and communication within the chiropractic profession. Mr. Petersen has served as Secretary for the Council on Chiropractic Guidelines and Practice Parameters since 1993 and was a member of the steering committee for the Mercy Center Conference on Guidelines for Chiropractic Quality Assurance and Practice Parameters (1993). His business expertise in the chiropractic community adds an important dimension to developing health care systems in the changing health care marketplace. Mr. Petersen received the Humanitarian of the Year award from the American Chiropractic Association in 1990 and 1996. Other awards and honors include the Excellence in Service award by the Congress of Chiropractic State Associations and the Doctor of Chiropractic Humanities designation from Cleveland Chiropractic College. Are Insurers Aware of Their Legal Obligations to You?